BioPact’s innovative drug delivery platform, Medical Grade Molecular Rebar (MGMR™), comprises discrete, individualized, pure, length-controlled, surface-functionalized carbon nanotubes (CNT). By utilizing our patented technology, drug developers can solve challenges in many arenas such as: controlled release, targeted delivery, transdermal delivery, toxicity, physiological instability, intracellular delivery, or crossing the blood-brain barrier. The unique properties of these tubes overcome the limitations of traditional CNT which are impure, tangled bundles of carbon. 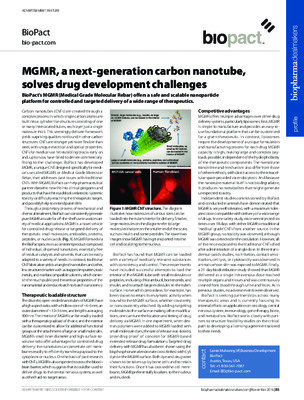 MGMR can be internally loaded with large and/or small molecules, regardless of chemistries, while the exterior of the tube is available for functionalization with bioactive agents to create a targeted drug delivery system.